It is that time of year again to gather all your best witches and throw a Halloween Bash! 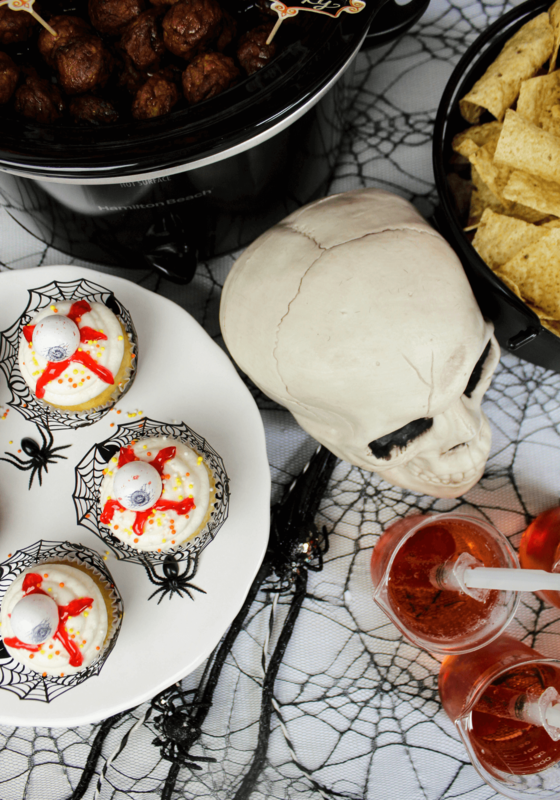 I have a full spread today from Hot Dog Mummies to Spiderweb Dip to deliciously spooky desserts like Eyeball Cupcakes made with 7UP®. This years Halloween Bash is a kid-friendly event! 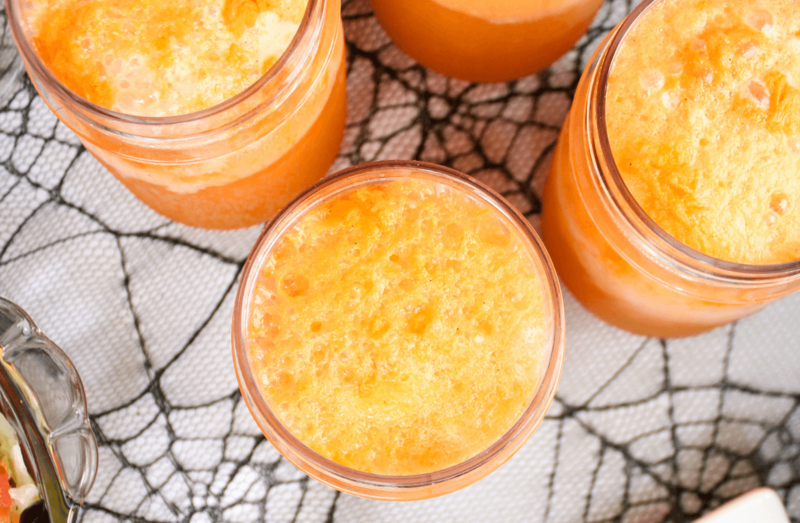 I created really simple recipes for you to copy that both kids and adults are going to love and drink choices that will please the entire crowd. Have you ever had a Bloody Shirley Temple? They are bloody good and I am sharing just how to make them. My first stop when throwing a great party is Walmart to grab all the goodies. Walmart has all the Halloween decor, costumes, food and drinks you could possibly need. Print out this grocery list and visit the seasonal department to make the party complete. 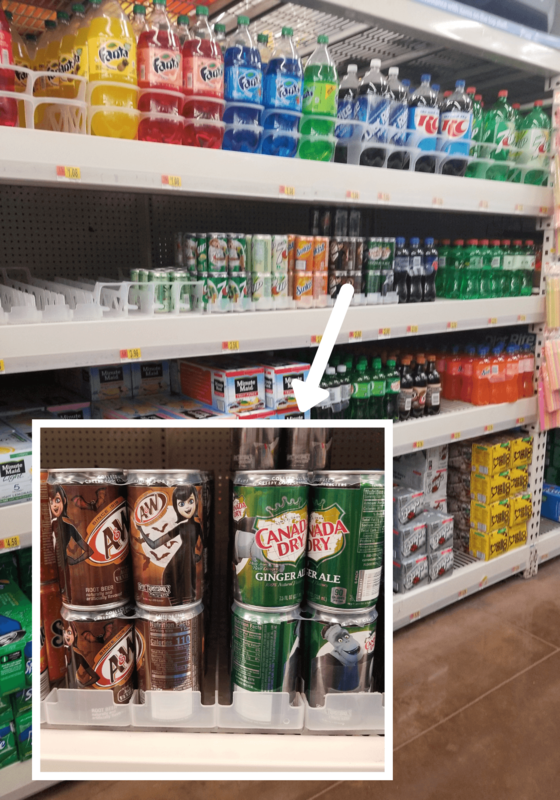 For a limited time you can find seasonal 7UP, A&W®, Sunkist®, Squirt® and Canada Dry® Minicans with your favorite characters, like Johnny or Mavis, available at Walmart on the beverage aisle. 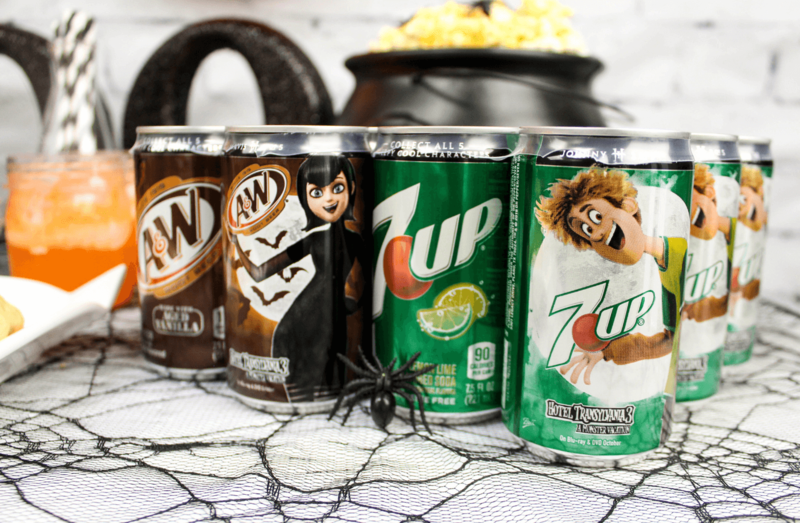 These minican beverages are the perfect size for a kids treat and you can create so many frighteningly good recipes with all the great flavors. 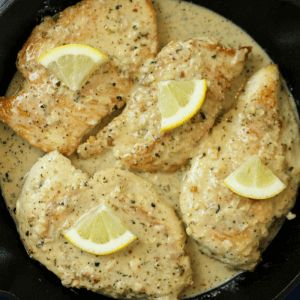 Click HERE for more recipe inspiration and party ideas! Decorations for the wall- bats or fake webs look great. Just a few extras like a skull, skeleton, crows, or whatever else you stumble upon at Walmart that will bring your room to life. 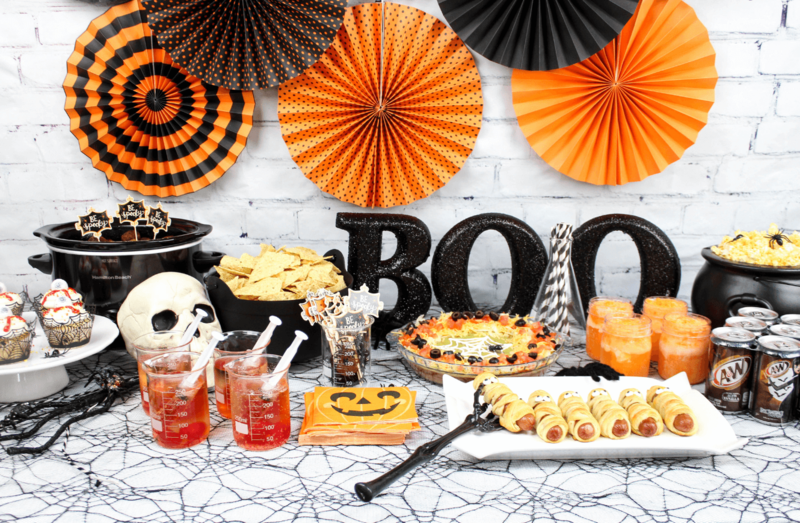 Halloween party food is more than just something to snack on! You will find great ideas below that are both decorative and delicious. Cook a few bags of popcorn according to packaged directions and place in a cauldron. Add a few fake spiders on top and you have an easy snack that everyone loves ready in a snap. These Hot Dog Mummies fused all kinds of excitement with the kids. I even received a round of applause from my three year old so I can guarantee these have been child-tested and child-approved. To make Hot Dog Mummies, pre-heat the oven to 375 degrees. Take 2 crescent roll sheets and use a rolling pin to quickly run over the top to get rid of any creases in the dough. Next, use a pizza cutter to make thin strips for the mummy “bandages”. I did 30 per sheet so 60 strips total. Wrap each hot dog with 3 strips leaving a space for the mummy face. Use the non-stick spray on a baking sheet, place the wrapped hot dogs on the baking sheet and bake 15 minutes or until the top is golden brown. Make the mummy faces with the candy eyeballs by squeezing a bit of mustard on the face area to help the eyes stick in place. 2 pound bag of frozen meatballs. 18 ounce bottle of your favorite BBQ sauce. 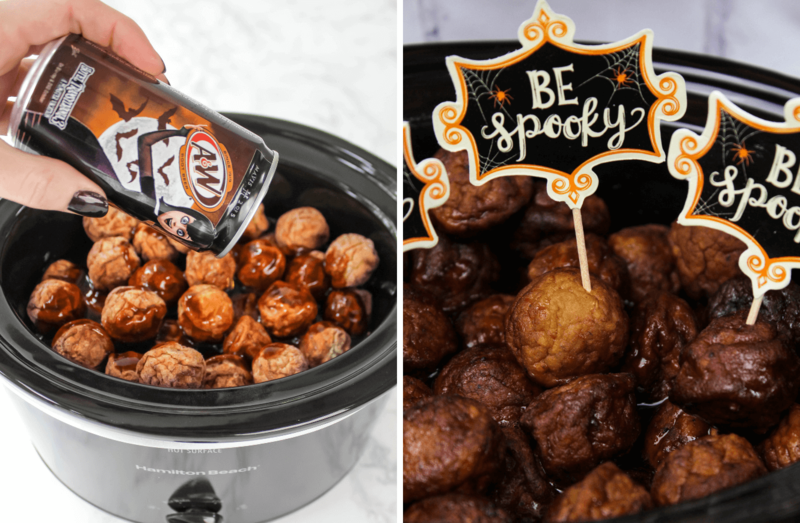 Place the frozen meatballs into a crock-pot with a bottle of BBQ sauce and an A&W Minican poured in. Cook on high 4 hours and serve with toothpicks for convenient snacking. Bloody Shirley Temples are a spin off from the classic drink. Fill each syringe with 10 ml of grenadine. Add Canada Dry into a glass with a couple cherries and the grenadine filled syringe. Let guests press the plunger of the syringe into the drink to create their own Bloody Shirley Temple. Food that is interactive is always a huge hit! 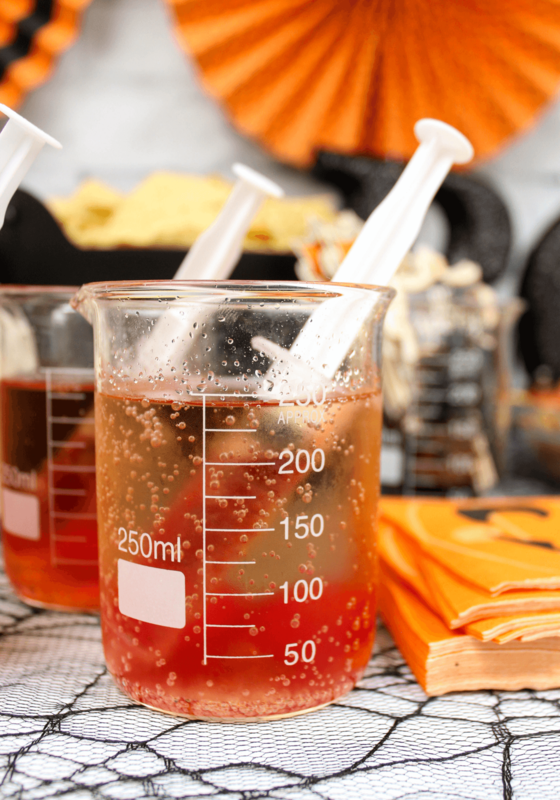 A Sunkist Minican and a scoop of vanilla ice cream combine in a cup to create a Jack-O-Lantern Float. 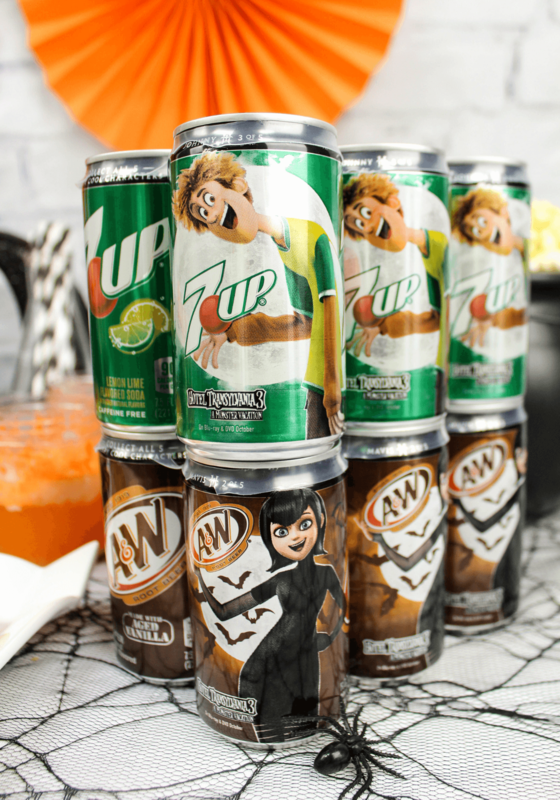 You can even draw a pumpkin face on each cup before the party for extra fun. 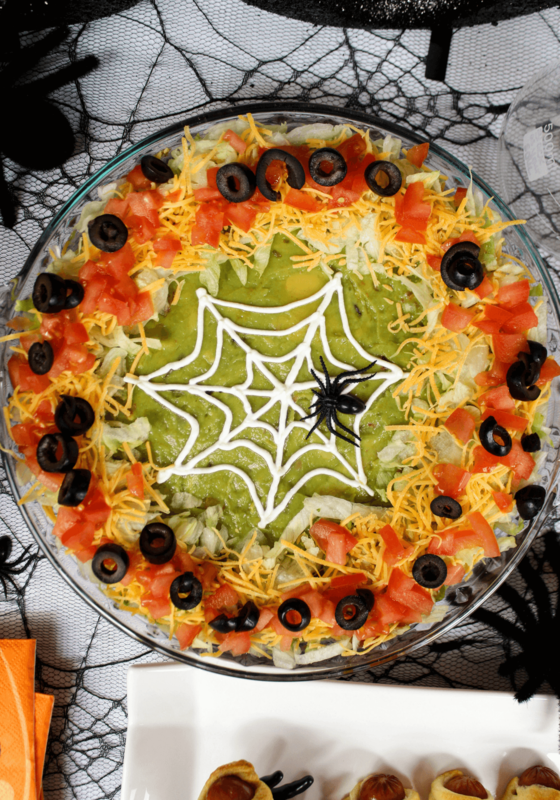 Could a party food be more fun than this Spiderweb Dip and Chips? My vote is no! You can have this dip done in just a few minutes and it tastes amazing. Start by mixing a packet of taco seasoning with a can of refried beans placing it in the bottom of a party bowl or pie pan. Add a layer of chunky salsa, followed by a layer of guacamole. Next, place sour cream into a pastry bag with a small decorating tip. Draw a spiderweb with the sour cream onto the guacamole layer. Finish the dip with spreading shredded lettuce, diced tomato, shredded cheese and sliced olives along the sides. Serve with tortilla chips. Grab your complete Walmart grocery list HERE to print out. 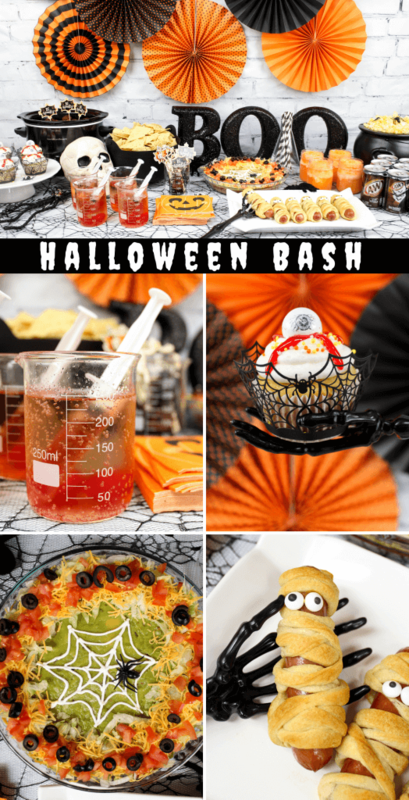 Don’t forget the decorations, costumes for the family and other spooky fun items to make your Halloween Bash completely epic! 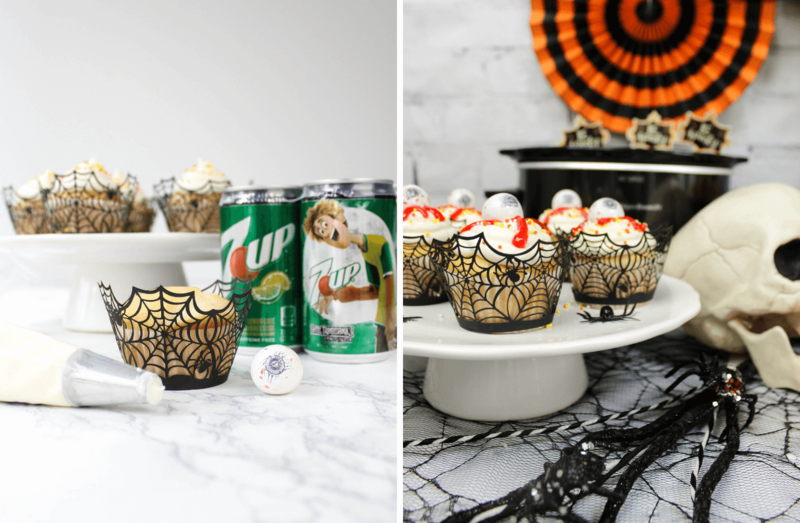 Eyeball Cupcakes are made with a basic white box cake mix, butter, egg whites and a can of 7UP topped with a really simple 7UP frosting and a bloody gumball eyeball. One of my favorite uses for 7UP is in cake mix! 7UP makes cake so moist and adds just a hint of flavor to a basic white cake. You need to give it a try for sure! 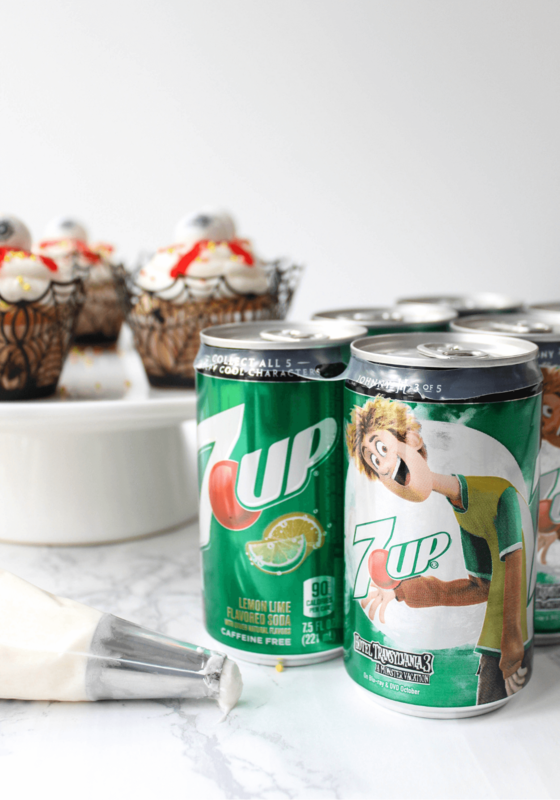 I always used 7UP in the frosting and adding some freshly squeezed lemon and lime giving the cupcake a really subtle flavor that works well. Since it is Halloween, we had to dress these cupcakes up with some sprinkles, a red gel for fake blood and a gumball eyeball. It is that time of year again to gather all your best witches and throw a Halloween Bash! 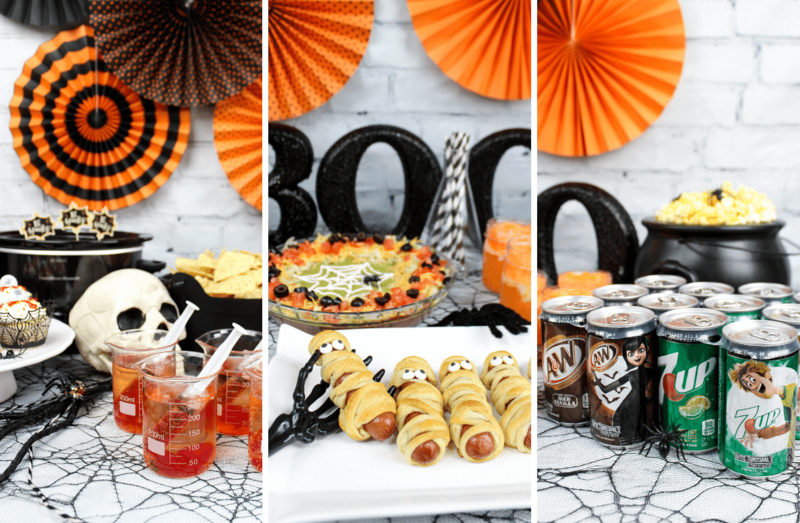 I have a full spread today from Hot Dog Mummies to Spiderweb Dip to deliciously spooky desserts like Eyeball Cupcakes made with 7UP®. In a mixing bowl, add the softened butter and beat. Add 3 egg whites, cake mix, 7.5 ounce 7UP® Minican and beat ingredients together until smooth. Place cupcake liners into a muffin pan and fill each liner 3/4 full of cake mix. Bake for 15-16 minutes or until a toothpick is inserted and comes out clean. Place cupcakes on a cooling rack. Once the cupcakes are cooled, start the frosting. In a mixing bowl, add a stick of butter and 1/2 cup all-vegetable shortening. Beat until creamy. Add 1 teaspoon lime juice, 1 teaspoon lemon juice. Beat again. Slowly add in the confectioners sugar and 1/4 cup 7UP® alternating between the two until you have a smooth mixture. You should be able to scoop some frosting on a spoon and turn upside down without it moving- that's when your frosting is ready. Note that you may not use all of the 7UP® so adding it slowly is key. Place the frosting into a pastry bag with a large frosting tip. Frost each cupcake. Shake sprinkles over the top. 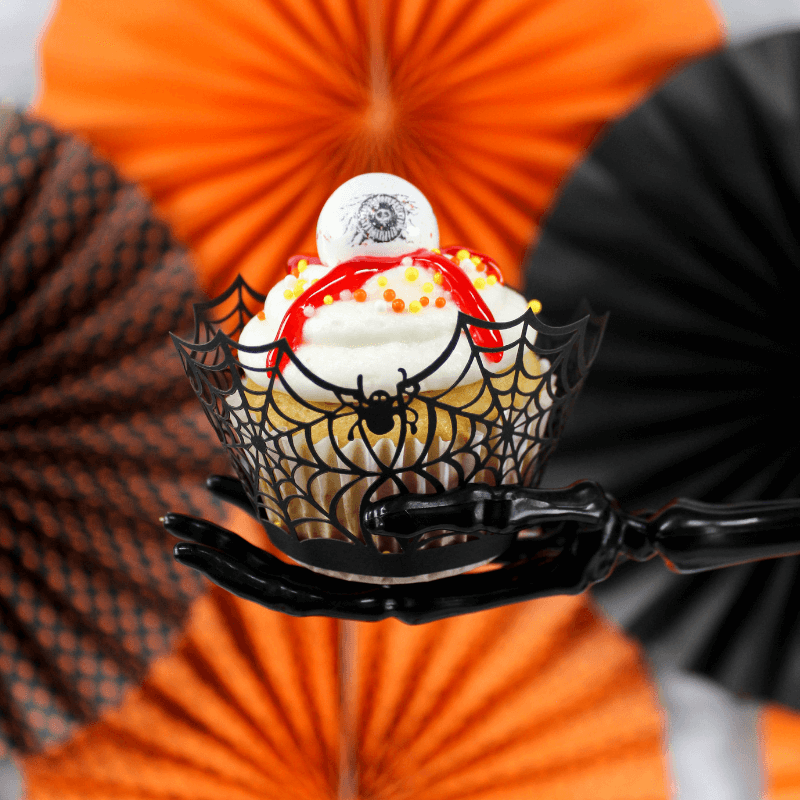 Start at the center of each cupcake and make lines coming down using the red decorating gel to mimic blood. Place a gumball eyeball in the center of each cupcake and serve. Check out this site for more Frighteningly Fun inspiration! Can I come to your Halloween party?!?? I love everything about this!! 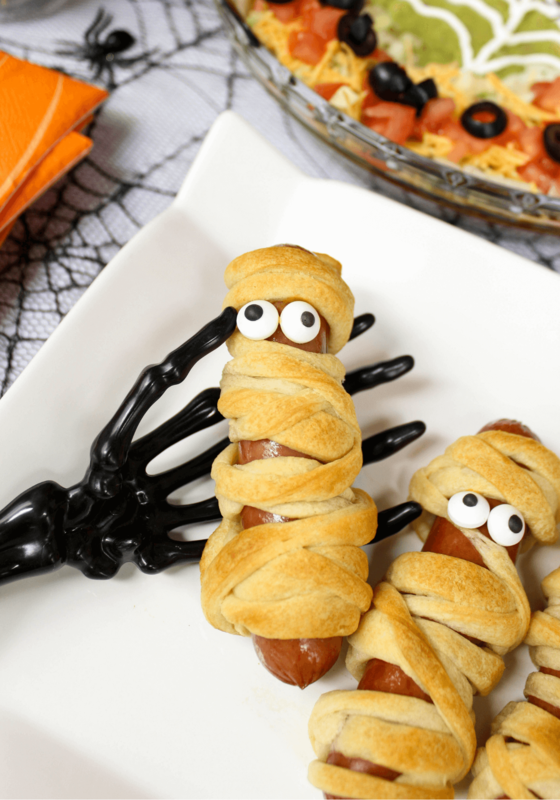 The hot dog mummies are SO cute!! this is amazing!!! I love it, such amazing ideas! Thanks Georgie! Hope you can use some of these for Halloween!